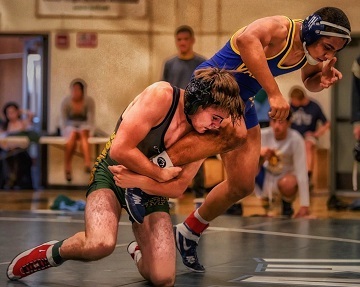 Mira Costa’s boys and girls wrestling teams are set to showcase their athletic ability as the postseason is underway. The Lady Mustangs have enjoyed a successful season and are led by two returning State Qualifiers in Allysa Nocum and Vivian Ramirez. The team is coming off a first-place finish at the Brea Olinda Girls Varsity tournament where Mira Costa had eight girls finish in the top three. “That was a phenomenal performance,” coach Jimmy Chaney said. “I am expecting them to finish strong again this year at CIF. Last year, they finished 8th in the entire Southern Section.” Mira Costa was hit by the flu bug last week with five girls out plus Chaney barely making it to the match against Redondo. The girls will compete in the Western Regional Qualifier tournament at Downey High School on Saturday, Feb. 9 which is a qualifier for the CIF Southern Section Girls Wrestling Championship Tournament, which takes place on Friday and Saturday, Feb. 15-16 at Eleanor Roosevelt High School in Eastvale. The top six wrestlers in each weight class will qualify for CIF-SS Championship with the top eight finishers qualifying for the Girl’s State Invitational Tournament Feb. 21-23 at the Rabobank Arena in Bakersfield. Mira Costa’s boys team is led by returning Master’s qualifier Tyler Gordon. He won the Irvine Invitational this year being named the outstanding upper weight wrestler of the tournament while recording the most pins in the shortest time. “We had a slow start this year, then Beverly Hills beat us,” Chaney said. “We hadn’t lost a league dual meet since 2014 and we take pride in winning duals. This loss woke us up and turned our team around. After that we have wrestled with a vengeance. We defeated Peninsula 60-6, Redondo 51-26 and South Torrance 42-38. South went on to win the Division 5 Dual Meet championship on Saturday. The six Divisional Championships will take place on Friday and Saturday, Feb. 8-9 with the purpose of determining the CIF Southern Section Individual Wrestling Champions, as well as Masters Meet qualifiers.